A Simple Kinda Life: Review and Giveaway: WAT-AAH! Awhile ago, I was introduced to WAT-AAH! and requested to do a review on this product. As you probably know, my son is playing recreational football for a county team and I thought WAT-AAH would be great for him! Here in Maryland, the summers are HOT and it was HOT when we got the WAT-AAH! in the mail. I put the bottles in the fridge and told the kids when they were cold that they could have one, but I told my daughter that the WAT-AAH! for more so for her brother because of football. My son has to stay hydrated for football. It is imperative. And, he's been really good about keeping hydrated - I think only once was he not hydrated enough and I believe he learned his lesson. He takes a jug of water and ice with him to practice and it lasts the whole time (2 hours). When we got the WAT-AAH, he put all of his bottles in the container with some ice and drank that. He later told me that he noticed the difference between drinking regular water and drinking the WAT-AAH, because it has added ingredients that water does not have. All WAT-AAH! drinks contain absolutely no sugar, which is great, especially since my daughter has ADHD and I have to watch her sugar intake. I'm one parent who doesn't give my kids soda (except for special occasions), caffeine, energy drinks, or anything like that. Very rarely they can have some of my iced tea, but mostly, they are drinking water, juice, or milk, and on some occasions, Kool-Aid. WAT-AAH! also has no artificial flavors, colors or unnatural additives. WAT-AAH! is ultra pure water containing the right amount of essential ingredients such as magnesium, electrolytes and oxygen to help maintain children's health. WAT-AAH! 's mission is to reverse the established behavior and dependency on sweetened drinks among America's children, and ultimately help fight the battle against childhood obesity and to teach kids that healthy bodies can be obtained through healthy hydration, http://www.wat-aah.com. One lucky winner will receive a WAT-AAH! Backpack filled w/ fun back-to-school goodies (pencils, erasers, stickers etc.) Along w/ WAT-AAH! samples! To enter, head over to WAT-AAH's Blog and tell me something you learned. This giveaway is open to US residents, and will end on November 5th at midnight EST. Winners will be announced in a post here at A Simple Kinda Life and will be emailed. Winners will have 48 hours to claim their prize or a new winner will be chosen. I learned that Michelle Obama hosted a Healthy Kids Faire last week at the White House. I learned that they're running a special halloween promotion with orange labels. I learned that "WAT-AAH! 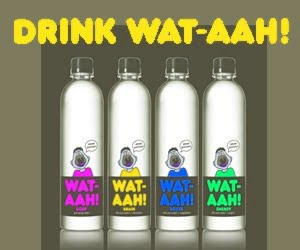 was in Bay Ridge, NY giving away WAT-AAH! along with COOL WAT-AAH! GOODIES to promote healthy hydration this Halloween!" "WAT-AAH! had an amazing time at The Cathedral High School Health Fair run by Healthcorps Coordinator, Jessica Kimmes." i learned alot of kids like this so maybe my son would drink it because he doesnt like regular water too much. I think its great that they are doing Halloween giveaways to encourage kids to be healthy. I learned that they had alot of Halloween giveaways. Great Promotion! I learned that the first line of defense in combating obesity is water.